All these things led me to believe that there is something very wrong with me. But the voices in my head told me not to believe such nonsense. You ever get an itch deep inside your ear that is impossible to scratch? Do you ever worry that it's parasites? If woman gives birth to man, and man impregnates woman, where did the chicken come from? If you blow on the dirt long enough, will it blow back? Or will you just have to take a shower? And if so, why is there a cow in your garage? What does all this have to do with comic books? Absolutely nothing, but I tricked you into reading it anyway. In the interest of staying on topic though, I present to you, free of charge and with limited commercial interruption, my list of comics you may not have read, that you definitely should read. 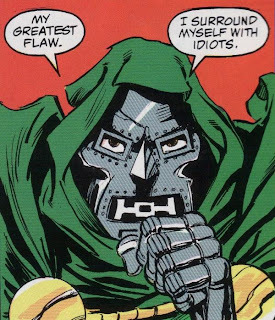 This Original Graphic Novel highlights, clarifies, and proves why Dr. Doom is the baddest of the bad. Pay no attention to those losses to that pansy Reed Richards, I chalk that up to hating him so bad that he can’t think straight when he goes up against him, which I can relate to. 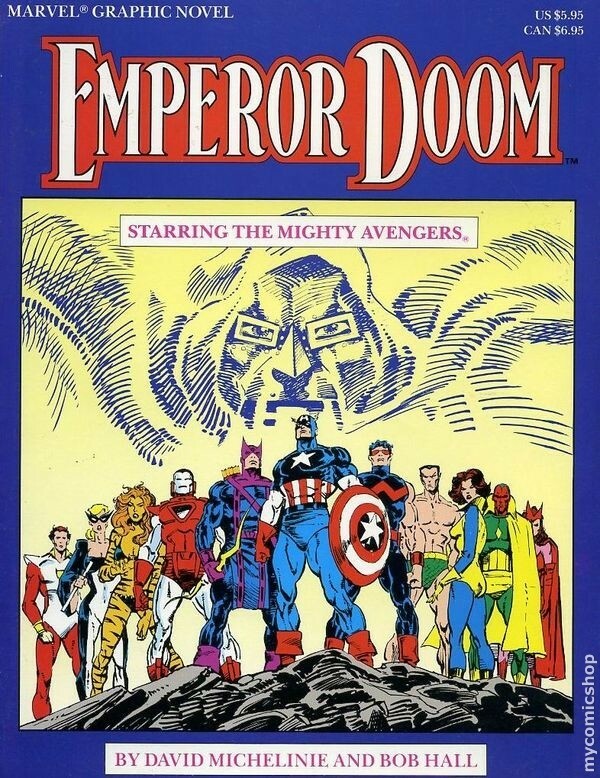 As I’ve said in previous columns, Doom will always be the ultimate Marvel villain to me, based on my early exposure to SECRET WARS as a child, and this book only solidifies that view. Dr. Doom is written especially well in this story. 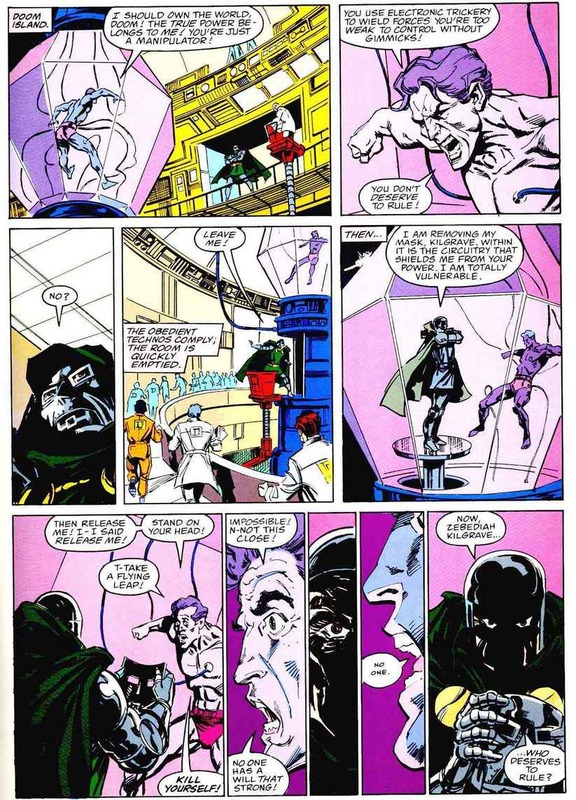 Check out this following exchange between Doom and the Purple Man as Doom prepares his machine. Later on, there is another classic line by Doom, as his minions celebrate a perceived victory a little bit too soon. Tell me you don’t want to read that comic now. 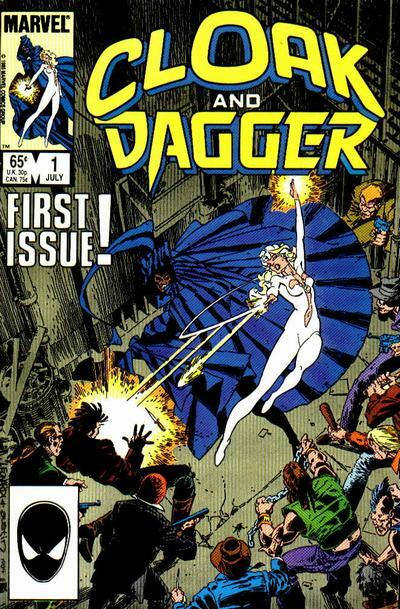 Following their appearances in SPECTACULAR SPIDER-MAN and their own four issue mini-series, Cloak and Dagger get their first shot at an ongoing title. The things that set this series apart from other Marvel series as the time, is also what I suspect led to its eventual cancellation with issue eleven. 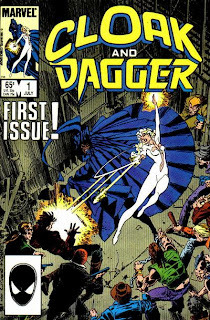 It’s a very street level book at the beginning, with only Cloak and Dagger being the extraordinary aspects to the book. Drugs, exploitation of kids, and prostitution were the enemies. Not a super-villain was in sight, which makes the change to a major supporting character in issue #5 all the more jarring. There is the obligatory cameo by Spider-Man in the third issue, and Dr. Doom appears in the tenth, but for the most part the focus in on Cloak and Dagger’s war against drugs. This is the characters as I remember them. With Cloak struggling against the darkness within him, basically holding back his thirst for the “light” of people, essentially a vampire succumbing to his hunger. To enter his cloak without Dagger’s assistance is to meet your deepest fears, and it drains your life essence. This is in direct contrast to his current place in the Marvel Universe as quick teleportation for heroes, with none of the achy side effects in place here. Dagger, however, is a beacon of light and innocence in this world. Torn between her desire for a normal life and their mission to protect innocent children, she finds herself constantly the object of others motivations. Cloak needs her for the light she can provide him, and because he can’t admit he needs her as his companion. The priest at the church where they rest, spends the series constantly trying to separate Dagger from Cloak, who he sees as a demon, but possibly has motivations of a physical nature to his obsession with Dagger. 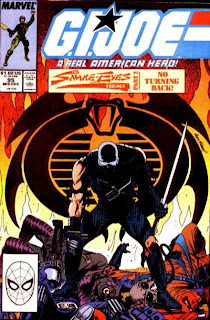 This series and these characters was Bill Mantlo at his very best as a writer. 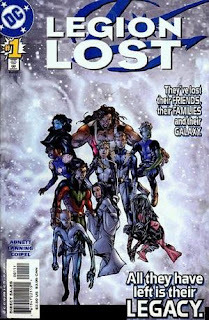 This was the original LEGION LOST miniseries, not the one that just came out in September from DCnU. 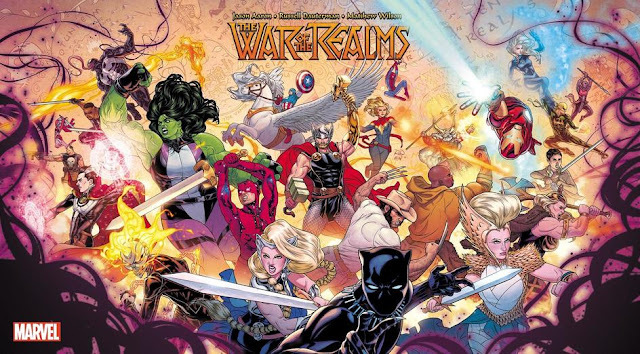 Written by Dan Abnett and Andy Lanning, who would go on to reinvigorate the Marvel cosmic universe to much acclaim with ANNIHILATION and GUARDIANS OF THE GALAXY,and pencilled by future Marvel superstar Oliver Coipel, who would go on to work on HOUSE OF M, THOR, and SIEGE. I only began reading LEGION OF SUPER-HEROES comics about 4–5 years ago. The continuity reboots and changes can scare even the most seasoned comic book veteran, but I am here to tell you it’s not as daunting as you think. This mini-series featured the Zero Hour reboot version of the team. I read it cold having never read any previous comics from this era, and I enjoyed it a great deal. 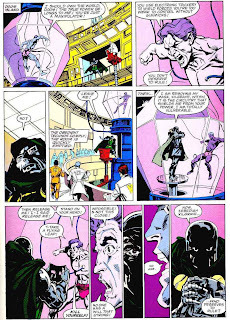 A small subsection of the Legion team finds themself thrown far outside the known, charted areas of the universe, so far that not even Brainiac 5 himself can figure out how to get them back. They find themselves on the run from a mysterious overlord called the Progenitor, and his army of bug-like soldiers called the Progeny. Not only do they have to fight off enemies, they have to fight off the despair of being truly lost, and figure out a way to get home. Themes of xenophobia and intolerance are explored here very well. There is a moment towards the end when they confront the revealed Progenitor that left chills in my spine, and a tear in my eye. An excellent miniseries that will have you saying “Delete the filthy variants” after you’re done. The story in this issue was kind of odd, but it was important to me for a couple reasons. 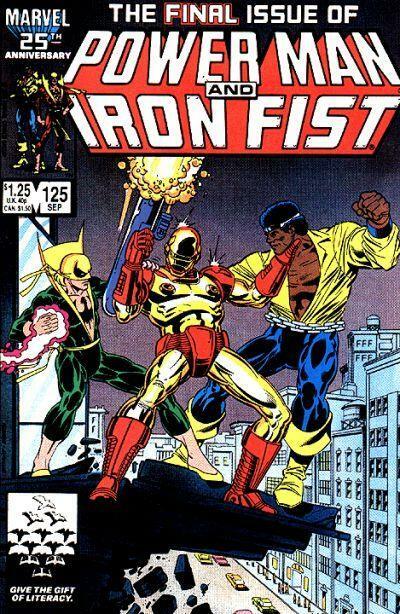 Iron Fist was one of my favorite characters as a younger lad, and this was the last issue of his shared series with Power Man. Back in the older times before the internet, if your local comic shop didn’t have an issue, you were pretty much out of luck. As chance would have it, on a trip to the magical world of Champaign, Illinois, I finally got my greasy hands on a copy of this issue. Only to find out, that Iron Fist is “killed” in this issue! One of my favorite characters removed from the fictional mortal coil! Needless to say, I was devastated, and this could very well be the reason I am the way I am to this day. I’m going to get real simple and direct with you on this one. No more need be explained. I love comic books, and I love sharing the books I love with other people. If any of the above sounds like it might be exciting or interesting to you, I encourage you to track it down. If you don’t like it, more than likely you hate everything, or at the very least can’t enjoy things, or possibly your name is William. So go, my minions, off into the world and discover these comics for yourself, or don’t. At the very least, please find out where that chicken came from. Good job, Ben! 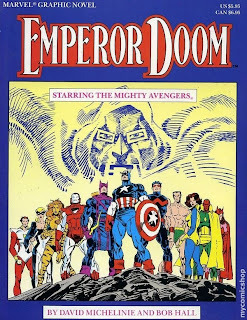 You've got me interested in Emperor Doom now. Legion Lost is awesome! Unfortunately the Progenitor reveal made me shed a tear too. Doom's "I surround myself with idiots" is the awesome counterbalance.